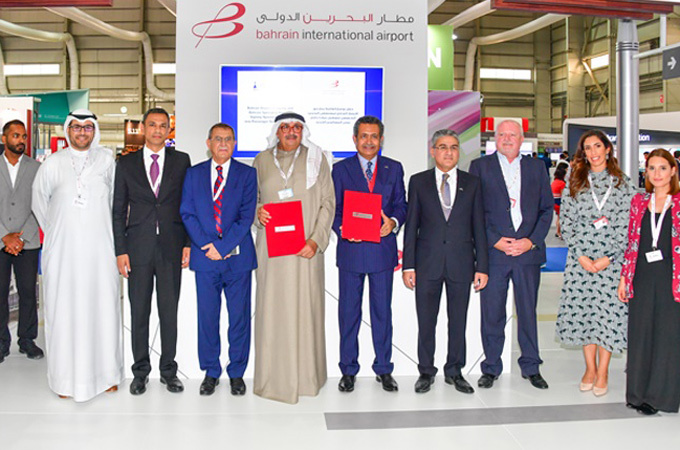 Key contracts aimed at elevating hospitality and healthcare services at the Bahrain International Airport (BIA) were awarded on the first day of the Bahrain International Airshow (BIAS) yesterday. Hala Bahrain, the premium hospitality and passenger services provider at BIA, has awarded a catering contract for all four of its lounges to Bahrain Airport Services (BAS), ensuring guests enjoy a wider variety of dining options, said Bahrain Airport Company (BAC), the airport’s operator and managing body. BAC chief executive officer and Hala Bahrain chairman Mohamed Yousif Al Binfalah and BAS chief executive officer Salman Al Mahmeed signed the one-year agreement in the presence of representatives from both companies, said a Bahrain News Agency report. BAC also awarded a contract for the operation of the new Passenger Terminal Building’s airport clinic to Bahrain Specialist Hospital. A dedicated team of healthcare professionals will be on hand 24/7 to provide various medical services to passengers and airport staff at the new facility. Al Binfalah signed the 10-year agreement with Bahrain Specialist Hospital chairman Hamed Rashid Al Zayani. Al Binfalah said: "We are delighted to partner with some of the kingdom’s leading companies to elevate BIA’s facilities and services. These milestone agreements mark another successful step in our journey towards the launch of the new Passenger Terminal building next year. BAC’s goal is to ensure travellers enjoy an exceptional airport experience from the moment they arrive right up until the second they leave, which is why having the right tenants and service providers in place is so essential. We look forward to announcing other landmark partnership agreements with some of the most widely-known local, regional, and international companies in the coming days." Held under the patronage of His Majesty King Hamad bin Isa Al Khalifa and the supervision of BIAS Supreme Organising Committee Chairman and the Personal Representative of His Majesty the King, His Highness Shaikh Abdullah bin Hamad Al Khalifa, BIAS 2018 runs until November 16 at Sakhir Air Base.